Strive for the best selection, service, and installation when choosing among carpet stores in Oxford, AL. There are many places you can buy carpet flooring, but you want to feel confident about the quality and selection. This is what makes Kemp Flooring unique. We offer a huge selection, and our flooring experts give you attentive personal service. Plus, we send our trained technicians to your home to make sure the flooring looks appealing endures wear and tear for many years to come. The particular carpeting you select depends on two main considerations: your lifestyle requirements and design preferences. Lifestyle requirements refer to the use your carpet receives. For example, do you have children or pets? 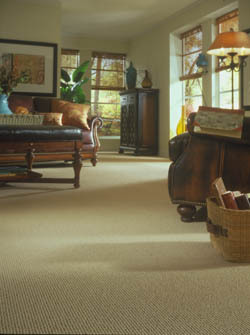 In this case, our experts recommend carpeting in high-performance fabrics, fibers, colors, and patterns. This stands up to the wear and tear of a busy household. Berber is a great selection for families because it is visually appealing, yet structurally strong. On the other hand, you may entertain frequently, but formally, and regard your home as a showcase. In that case, our experts show you elegant styles made with fine fabrics and a lush look. Such carpeting sets the stage for handsome furnishings and stunning artwork. However, in our showroom, beauty and performance aren’t mutually exclusive. With the top brands from trusted manufacturers, we provide you with carpet flooring that’s as beautiful as it is strong and enduring. Just share your requirements with our experts, and we find flooring that meets your needs. Next, we turn to design preferences. This refers to decorating styles that range from minimalist to modern and classic to industrial. Let us work with you in selecting carpeting that achieves your goals, whether you want to use the flooring to tie colors and texture together or serve as a focal point for your room. That said, we offer carpeting in a variety of price points, starting at $.89 per square foot. A popular selection that gives you the opportunity to use your creativity to mix and match is a carpet square. These make decorating fun as you can pick different colors and/or patterns for a look that is uniquely appealing. These little squares are versatile, sturdy, and water-resistant. Whatever carpet style you choose, we recommend professional installation. We’ve seen the proof in carpeting that retains its good looks for many years when installed by knowledgeable technicians. Reach out to us to schedule installation after you’ve chosen your favorite. Contact us today with the questions you have about different brands and materials for carpet flooring. With a showroom in Oxford, Alabama, we proudly serve residential and commercial customers in Calhoun, Talladega, and Lincoln counties, as well as Bynum and Delta, and the surrounding areas.